The information you have been waiting for since this event was announced in 2013 is now available! The route has been updated with approximate mileage and host hotels in the cities where that information is available. Click over to http://www.minitakesthestates.com/welcome to get what you need. Register opens March 27th. Be sure to mark those calendars. Ok, fess up. Who’s going and how far? Planning on just the 1st leg. SF to Reno then home. I’m lucky to get 1 day off work. But….I WILL be in the new MINI Clubman! So huzzah! That’s awesome. Being able to do any is better than not being able to do none. Can’t wait to see the Clubman! 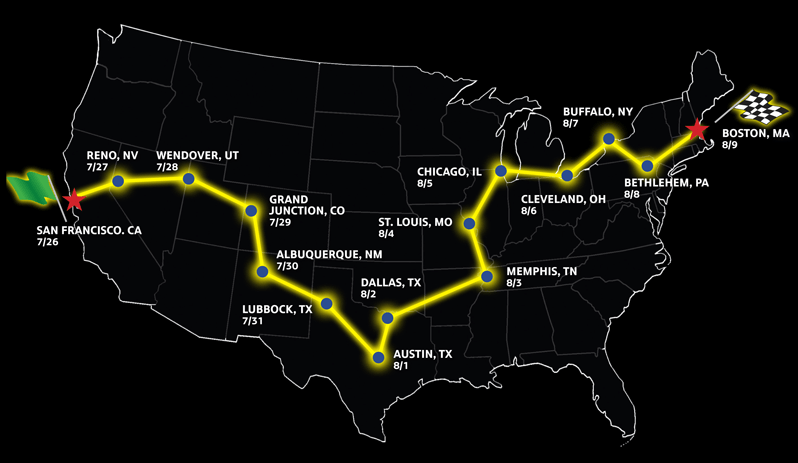 This will be our third MTTS (we went part of the way in 2010 and 2012). This year we are planning to do the entire route! Mini does a great job and we can’t wait to see what they plan for MTTS 2014!! I’m hoping to go all the way this year too. Very excited for this! This will also be my third MTTS. Went as far as Pittsburgh in 2010 and all the way in 2012. Planning on the whole route this year again with 3 weeks off from work. 2012 was an experience like no other… Planning to hit the Black Hills, the Tetons, Yosemite, and a little of PCH on my way out to San Francisco…. I am also a few days away from FINALLY finishing my 2012 MTTS video (it’s taken almost 2 years!!). I wanted to get it out soon to inspire people this year. It’s 3 to 4 hours of video, stop-action, photography, music and what-not, all mixed together to cover pretty much the whole 2012 event. Watched it whole last night for the first time – still needs a little editing but pretty cool stuff if I can brag on it. Will let you guys know when it’s up on YouTube.